Our Book Carts offer multi-shelf storage space and responsive rolling casters to smoothly organize and transport book collections in your school or office library. They're available in wood and metal frames to match your indoor decor. Pick up a Book Cart today for easy mobility with plenty of room for all your literature and multimedia items. Metal and wood book carts and book trucks, for the Library, Office, or Home. Rolling utility book carts make great space savers. If you're looking for a book cart, why not stop here and browse through the wide collection of book carts we offer to find the one that best suits your needs and tastes? A utility book cart is handy around the home, allowing you to move or store a variety of objects at once, and essential in the school or office. They cut down on hassle and improve productivity. Not only do we have a broad, high quality selection, but we offer prices that can't be matched. Take a moment to search our extensive website and take advantage of its new features.The varieties and uses of a mobile book cart are endless. A library book cart not only improves the organization of books and materials returned, arranged, or stacked, but makes shelving and cataloging more efficient. You can choose from either a wooden book cart or metal book cart to match your decor. Why burden a secretary or office worker when a rolling book cart can make his or her work easier? A shelf book cart can be the perfect solution to storing objects transported frequently. Feel free to contact us today with any questions. We take pride in offering the highest quality, most affordable home and office supplies available. For over 50 years we have provided the best products, and earned a long list of satisfied customers. We look forward to meeting your needs.Our book carts offer multi-shelf storage space and responsive rolling casters to smoothly organize and transport book collections in your school or office library. 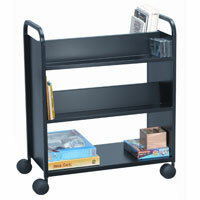 Pick up a utility book cart today for easy mobility with plenty of room for all your literature and multimedia items. If you're shopping for a book cart, take a moment to look through the wide selection of book carts on our website. US Markerboard is a Whiteboard company. Our main offerings include: Porcelain Magnetic Whiteboards, Freestanding Whiteboards, and Unframed Whiteboards for schools, offices, hospitals and more. We also carry a full line of Metal Book Carts and Wood Book Carts for the Library or office.